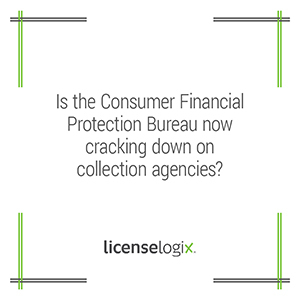 Is CFPB cracking down on collection agencies? In July 2013, the Consumer Financial Protection Bureau (CFPB) announced that all companies under Bureau jurisdiction will be held accountable for unlawful conduct in collecting consumers’ debts and that it is now accepting debt collection complaints from consumers. The CFPB, headed by Director Richard Cordray, stated in the announcement that banks and third party companies trying to collect on consumer debt cannot lie about the amount owed, falsely threaten lawsuits, or mislead consumers about how repaying debt will affect their credit scores. Despite the CFPB’s recent announcement, scrutiny over debt collection practices has been occurring for several years. The scrutiny began around 2007 when numerous Americans became unemployed or otherwise ran into financial hardship and fell behind on debt payments. This increase in lapsed debt corresponded to the severe rise in consumer complaints about debt collection practices. In 2010, the Dodd–Frank Wall Street Reform & Consumer Protection Act created the CFPB, an executive agency within the Federal Reserve, to enforce consumer protection laws and to eliminate deceptive practices among other responsibilities. This means the CFPB maintains authority over debt collection, debt management, extension of credit, mortgage loans, etc., and is able to launch investigations as well as initiate litigation. The CFPB works closely with the Federal Trade Commission (FTC). Both agencies are committed to protecting Americans from financial scams and illegal practices. Over the last couple of years several lawsuits against collection agencies resulted in significant fines and penalties. July 2013, the FTC levied a record penalty of $2.3 million against one of the world’s largest debt collection agencies. January 2013, the FTC entered into a $2.5 million settlement with a large debt collection agency based in MI. While the FTC and CFPB are cracking down on debt collection practices, states are also stepping up efforts against unlicensed debt collection agencies. Since 2008, several states filed lawsuits against collection agencies for operating without a license. August 2008, Connecticut issued a cease and desist order shutting down a collection agency based in Waterbury, Connecticut. August 2011, two New York based debt collection firms agreed to stop collecting debts in West Virginia without a license and agreed to refund or cancel over $11,000 in debts and pay the state $5,000. March 2012, The Washington Department of Licensing began investigating an Oregon based agency for collecting debts in Washington without a license. December 2012, the state of Minnesota fined a debt collector and his company $100,000 for various violations including operating without a license. The debt collector also faces a maximum penalty of 30 years in prison. Clearly, consumer protection watchdogs are actively investigating and penalizing debt collection agencies in addition to other financial institutions. CFPD Director Richard Cordray stated in a public announcement on the CFPD website, “it doesn’t matter who is collecting the debt -- unfair, deceptive or abusive practices are illegal.” The first step in avoiding fines and penalties is to be sure your business is fully licensed in all relevant jurisdictions. Debt collection agencies operating without appropriate permits or with an expired permit are subject to both state and local penalties. Penalties range from high fines to cease and desist orders and even criminal penalties, such as jail time and probation. With such severe penalties, it is crucial that debt collection businesses obtain and maintain the appropriate licenses. The licensing experts at LicenseLogix will manage the process of obtaining your debt collection license. LicenseLogix can help you obtain all the licenses and registrations you need, as well as perform business license research, and manage your ongoing license renewals. For additional help you can contact us, or give us a call at (800) 292-0909.